Hello! 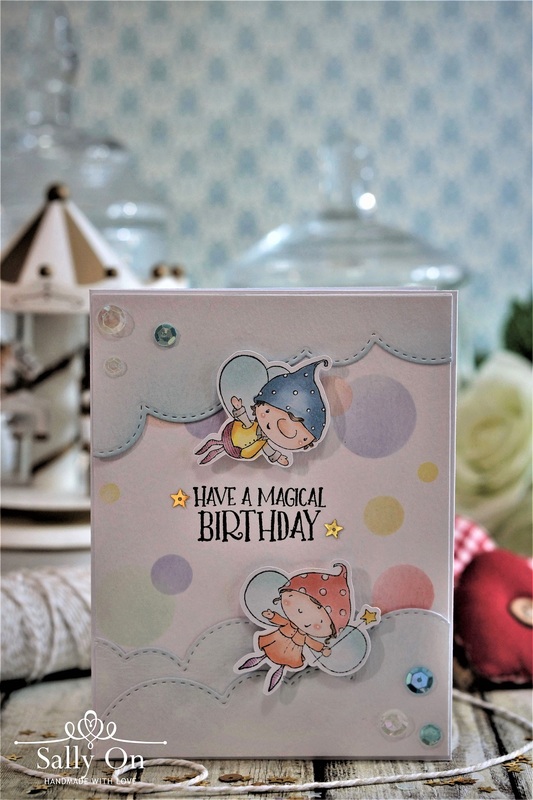 Today I'll be sharing another card that I've made using the 3 images from the new Spread Kindness collection from Stacey Yacula, which is now available at Purple Onion Designs. Have you seen the new collection already? If not, it's time to hop over to the blog and website to take a look! (: Spread Kindness collection is a tad different from the past collections as it offers traditional images and florals plus the usual lovable critters. The traditional images can be used on it's own and also can be pair up together with the lovable critters. Stamps used: Flynt (boy fairy), Goldie (girl fairy), Essential Thoughts Sentiment set. I stamped Flynt and Goldie with Memento ink in Black Tuxedo and coloured them with my favourite Copic markers. The background, with the dreamy colours of bubbles, is created using various colours of distress inks and the stencil, basic shapes - Circles from My Favorite Things. I recently discovered how versatile and easy it is to use stencils to create a background, it's really fun! 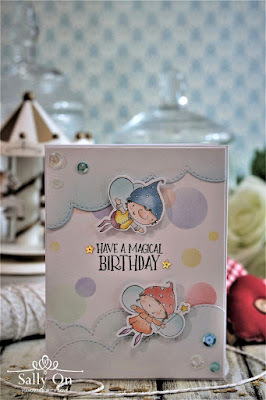 I wanted a whimsical feel to the card and so I added some puffy clouds using the Puffy Clouds border from Lawn Fawn to the top and bottom of the card to also give it a bit of dimension. Lastly, I picked some sequins of my favourite colours and added them near the corners of the card. I hope you like this fun, magical and fairly easy-to-make card that I've shared today! Remember, the bundle sales is still on till Friday 22 June. Be sure to check here for more details of the offers and savings!